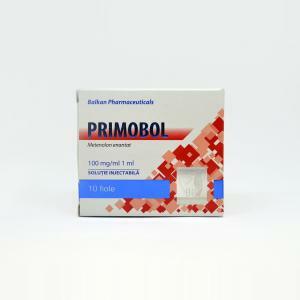 Primobol from Balkan Pharmaceuticals – it is a quite “soft” steroid that is most used by athletes in the drying period in order to keep up the muscle mass and give it a bump. Produced in injectable form. 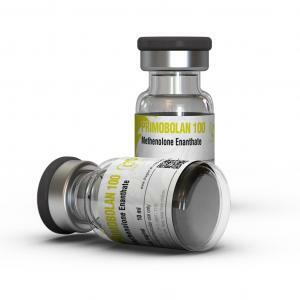 Active substance of the injectable Primobol is Methenolone Enanthate which has a weak anabolic (88% from testosterone) and androgenic (44% from testosterone) effects. It is quite safe for the liver, does not aromatize, and is recommended for beginners athletes as a first steroid agent. Given the lack of side effects and relatively low impact on the body, Primobol is often used by women. The injectable form of Primobol is active in the body for 10-14 days. Detection time for injections – up to 6 months. Improving the quality of the muscles. Primobol adds muscle mass, but perfectly “draws” the fibers, making them more prominent and solid. Stimulation of metabolic processes in the body. One of the main advantages of the preparation is the absence of conversion into estrogen. Its administration is not accompanied by swelling or gynecomastia. 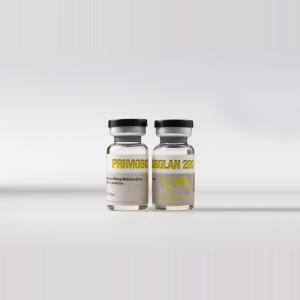 Primobol in its action is more suitable for drying than for gaining muscle mass, which is proved by testimonials from those whose goal was a set of muscle mass. 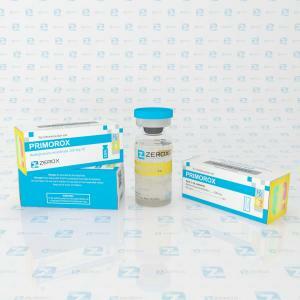 Primobol cycle lasts about eight weeks, due to the moderate action of the drug. Increasing the duration of admission it is not recommended due to possible occurrence of side effects. The best time to receive it is during the drying cycle. In this case, the application of Primobol helps to keep the muscles and make them more prominent. Injectable Primobol dosage is 400 mg once a week. PCT should begin in 3 weeks after the last injection. As how to take Primobol in combination with other drugs – a very frequently asked question, given its weak anabolic effect. It is best to set a Primobol cycle on mass combined with Nandrolone, Testosterone, Methandrostenolone and Sustanon. During the drying of muscles is activated Winstrol. In preparing the combined rate is not recommended to be used simultaneously by more than two drugs. Both used steroid is better to be taken in half doses – it will not only increase their efficiency, but also reduce the risk of side effects. 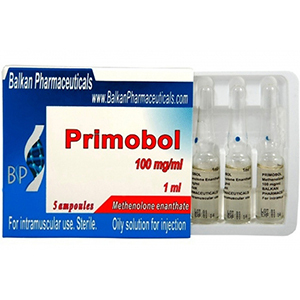 Unlike most anabolic steroids, injectable Primobol practically does not increase blood pressure. Also, it does not cause the rise of bad cholesterol. From contraindications to be noted only pregnancy and lactation. However, before Primobol cycle, like with other steroids, it is better to consult a doctor. From professional athletes can be heard quite discreet reviews about how to buy Primobol. They practically do not use it solo because they consider it ineffective. Much more frequent reviews of Primobol are related to its combination with other anabolic steroids. Athletes appreciate the ability of drug to hold gained muscle mass, helping to improve its relief and stiffness. Comments about the Primobol side effects almost never occur.